Should have these done on Thursday, unless something comes up. I'll have both to you in about 7-8 hours. Yeah, that's fine. I'm starting in about 24 hours. Hey Davidski, when are the Tanzanian South-Cushitic pastoralist genomes being published? And have you heard of any Neolithic and Paleolithic genomes from Northeast Africa yet? Especially the Nubia? Thanks. And this is a great project. Will you also check ancients? In other words, will you check if Iran Chalcolithic shares with Yamnaya rather than others? I mean, it may settle a huge number of debates, or at least give a hint at where to look. No idea when the African genomes are coming out. The paper is probably in peer review now. Iran_ChL genomes are pseudo-haploid. Can't run them in this. O, I see. Not everything can be used for this. "This kind of thing is inevitable. There can be lab mixups of various types or reburials (so a body winds up in deeper strata). This is a reason that I am nervous about making heavy inference from samples that are outliers in a population. c) Or something is wrong. Often hard to tell. The Reich lab is carbon dating more and more samples though this is expensive!" From what I read in the Sup Info of Mathieson 2015 they did not mention carbon dating of the remains, only of the site. Do you know how sure we can be that the Khvalynsk outlier actually is a Khvalynsk sample? Do you know how sure we can be that the Khvalynsk outlier actually is a Khvalynsk sample? He wasn't actually marked as an outlier in any papers to date. But I don't know how his archaeological affiliation was determined exactly and whether it was a high confidence call. You might need to ask Nick Patterson about that. @David - But I don't know how his archaeological affiliation was determined exactly and whether it was a high confidence call. You might need to ask Nick Patterson about that. I'm afraid I'll have to sit this out. Family health crisis unfortunately. Next time. The analysis is underway. Please don't send any more data files. If there's enough interest, I'll do another run soon. Hi, this is my matrix. Now it remains to know its meaning. Comments! OK, I sent out the output files not long ago and updated the blog post with some ideas and instructions. Check out my Neighbor joining tree! Also, Matt, if you're reading this, here's the matrix with over 3,000 public samples. I'm American, 7/8th Norwegian by descent. Only two Russian Northwest and three Saami samples, but there seems to be a real connection. I score as about 2% Siberian on ADMIXTURE calculators, so it makes sense. Two of my three closest individual matches were to Chuvash. Small samples, so I don't know whether to make a big deal out of these results. My closest matches are to an Unetice Pole from around 1800 B.C. and an R1b Swede from around 2100 B.C. The other Unetice sample was a dud, so I suspect that with enough data I would turn out closest to the Neolithic Scandinavians. @ Davidski, cheers for the shoutout. The size of that matrix is really at or beyond the limits of what I can do with averaging out with the spreadsheet method I use (or at least, it maybe takes longer than i have patience for ;) ) but thanks. I'm sure everyone would be okay with you using our data for graphing. You're free to use mine, for sure. I'll have my stuff up here soon. West Ukrainian culturally for 250 years paper trail. Thanks for you work, David! My ancients are easy to interpret. Among the top 11 I have three samples from Roman Britain Driffield Terrace. As I am South_Dutch/Belgian, it seems plausible that they had a lot of Belgae ancestry. You need an autsomal data file from FTDNA, Ancestry or 23andMe. They usually go for around $100 these days. "I simply loaded my "ancients_only" file into Past 3, selected all of the columns and rows, and then did this: Multivariate > Clustering > Neighbor joining. Note that I cluster on the same branch as Slav_Bohemia, and this makes perfect sense considering my Polish ancestry. By the way, I dropped Oetzi from this run because he was behaving strangely, which is not unusual for low coverage genomes. Click on the image and open in a new tab for a better view." This didn't seem to work for me. When I clicked after "Neighbour joining" I was told that the first two rows (in effect since I had to experiment with removals. Anything less than these two rows as a whole was constantly termed erroneous) were errors. When I removed them I did get a result, but the clusters included only the ancient samples and not my figures. I'm a NW European, but I also clustered with Slav Bohemia on the neighbor joining tree. This does happen occasionally, probably because Slav_Bohemia is the most recent ancient genome in the analysis. Different clustering methods might show different results as well. Should I use an ancient or a relevant average modern population for the Generalized Linear Model? Each population's label sits at the centre of where its dots (individual samples) plot - and there's a lot of variation within each population here. First PC1 separates populations which are generally high tract length sharers with the ancients from populations which are low. This dimension spans the British Isles+Norway on the positive end, as the highest sharers cumulatively with all ancients, down to Near East on the negative with very little sharing. Most of the rest of Europe about 50-75% the distance from the Near East to BI on this dimension. (A point of interest to me is that the British Isles is distinct here from populations who generally look to have similar proportions of WHG:Anatolian:Steppe, like Slovakian or German, and overlap heavily with one another. This does not mean that they have more ancient European ancestry or something but is due to the ancients including BI ancients and generally from the whole region from Iberia->Germany, and more likely to be specifically ancestral.). Second PC2 then splits populations with relatively high Iberia farmer sharing and lower Steppe and Karasuk (e.g. most extreme Sardinian) sharing on the other from populations who are the reverse (e.g. most extreme Kets). * For an alternative list of population groupings: https://pastebin.com/TCbjTbiJ. I've merged a lot of the populations here, to make it easier for me to run averages. That gives a more decompressed look at the variation in the European populations without hugely changing the PCs. Removed in case the preponderance of Iron Age to CE samples from Britain were swelling up the BI position in PC1. Does appear to have reduced that effect, however the graph is mostly the same, so this shape doesn't only or mainly come from that. Flattens things out once again, however again, no major changes. This PC3 splits a tendency on the posistive end to share CM with the most recent ancestors of Eastern European - HungaryBA and Slav Bohemia - from a more general set of affinities to the ancients in general on the negative end of the PC. Once decent quality samples from the largely Steppe_EMBA+Narva Baltic_BA population are available, I expect they would also load heavily on the positive end of a similar PC. Contrasting the position of the Tajik populations (and apparently Uralic speaking Udmurds) are also pretty interesting here, fitting relatively close to Eastern Europe in the overall structure of PC1 and PC2, due to both having relatively high steppe related CM sharing and lower CM sharing with ancient Iberians and North-Central Bronze Age Europeans... and then very distinct in PC3 because, of course, not sharing these more recent ancestors from late Bronze Age to late Iron Age / CE with present day Eastern European people. Removed in case the preponderance of Iron Age to CE British samples were swelling up the BI position in PC1. Does appear to have reduced that effect, however the graph is mostly the same, so this shape doesn't only or mainly come from that. 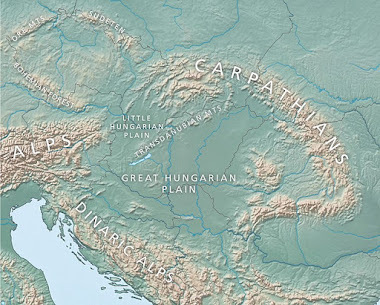 This PC3 splits a tendency on the posistive end to share CM with the most recent ancestors of Eastern European - HungaryBA and Slav Bohemia - from a more general set of affinities to the ancients in general on the negative end of the PC. Once decent quality samples from the largely Steppe_EMBA+Narva Baltic_BA population are available, I expect they would also be part of loading heavily on the positive end of a similar PC. Contrasting the position of the Tajik populations and apparently Uralic Udmurds are also pretty interesting here, fitting relatively close to Eastern Europe in the overall structure of PC1 and PC2, due to having relatively high steppe related CM sharing and lower CM sharing with ancient Iberians and North-Central Bronze Age Europeans... and then very distinct in PC3 because, of course, due to not sharing these more recent ancestors from late Bronze Age to late Iron Age / CE with present day Eastern European people. (At Davidski, sorry, an earlier version of this got trapped in your anti-link spam filter, so please delete that if you see). (Fewer columns so slightly more noise in position of populations with low n). (Btw, I think the method of running an average I have here may be slightly better than the one I used before, which I'm as sure about now. Apologies, folks who used that data). I don't know much about H6a1a. But I'd say that you should be able to track the entry of your lineage into Central Europe with precision within a few years as many more ancient mito genomes are sequenced. A lot of the results posted here make sense. Iberia Chalcolithic and modern Spain matching with a Spaniard, Nordin_LN with Norwegian, Roman Britain for England and NW France. But if one's ancestry is so mixed I doubt this test is of much use. Interestingly, Yamnaya seems to keep popping up for NW Euros. We'd have to see other European results to see if this is a legitimate correlation. 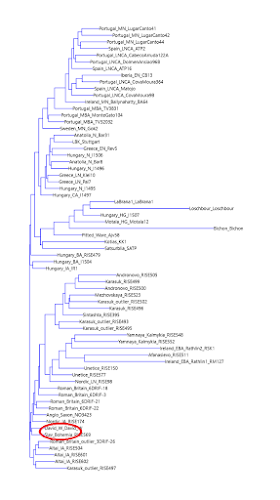 Could something like this resolve genealogical relationships between Olalde and Mathiesons's ancient genomes? Like who was North Bell Beaker's Neolithic ancestor? This is the age estimate I get for H6a1. "Steppe" could have formed between 5000 and 4000 BC which several thousand years after these age estimates. I'm thinking H6a1 had already formed and expanded in the Caucasus before coming onto the Steppe. Old Britons, Nordic and Anglo-Saxons are at the top of my list. So had a go at calculating population averages for length CM sharing. It does seem that they vary hugely between population, going from 3806(!) in Nganasan down to 2 in Cypriot. Values are huge in modern Siberians, even by comparison to Bronze Age and HG ancients. Some of these groups are compromised of relatively close relatives, particularly the small Siberian groups - surprised me that these were way high than Karitiana who look very drifted in Fst scores, and isolated maritime Oceanian populations. Europeans generally have very short or average sharing averages within populations (which makes sense for huge and admixing populations) in the range of 2 - 20. 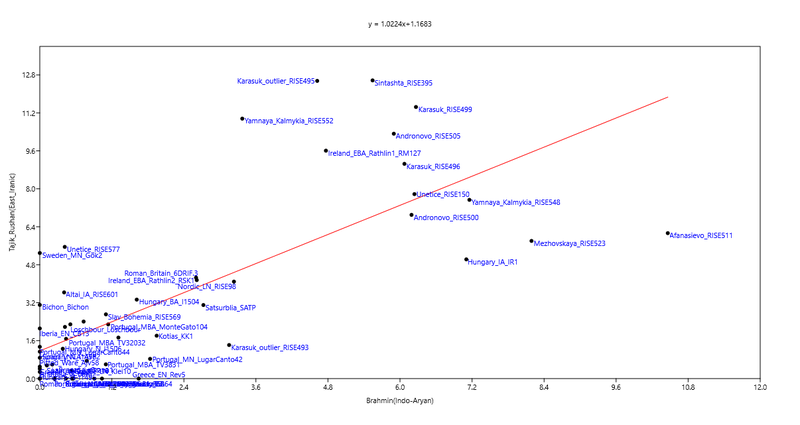 There are some clear outliers in Russian Central (288) and Cossack Ukrainian (162) who may have been sampled from relatively close relatives (not close enough like first order relatives to distort unlinked PCA, but close enough to have a high excess of sharing here). The sheer diversity of value sizes looks to make it impossible just to run a PCA on these. Even in neighbour joining, the branch length differences are huge. Using lengths is super sensitive to very recent shared relatedness, which can be significant in panels where they're only screening out very close relatives (because it's not important to the work they're doing), or it's not possible to do that because the populations are so small. (This is why chunkcounts can be more useful for PCA in some circumstances than the length information?). How would this work compared to running 100 SNPs and 3 cM against these samples in Gedmatch? Also, with phased SNP array data, many of the smaller segments tend to vanish. That's not "IBS vs. IBD", just "unphased data and faulty results". Use the DNA.land ~39 million imputed SNPs instead of the typical arrays. Do we really know the IBD segments at the whole genome sequence level that constitute "WHG, Anatolian Neolithic, Iranian Neolithic" etc.? What do we know about IBD between some of these high-coverage ancient whole genomes and modern whole genome sequences, for example from the 1K Genomes and the SGDP? Does this look the same as IBD using the "minimal set' of SNPs? What about very rare alleles? Also how about using the Southern and Eastern African aDNA samples, and also waiting for the aDNA North Africans? This is probably more of a haplotype test than an IBD test, but whatever it is, it's more informative for fine scale ancestry than using unlinked markers (thus, much better than IBS, for example), and indeed very accurate. The accuracy of the output can be seen in these PCA. Also, unlike IBD tests elsewhere, there is a lot of already integrated output, so users don't have to ask other users for their results, or try to run reference samples themselves, to put their own results into a context. However, I really can't just add ancient samples from different sources. It's best if all of the ancient samples are genotyped and prepped in exactly the same way. I ran 2 Generalized Linear Models with the Anglo-Saxon and the Nordic IA RISE174. It looks like I share somewhat more ancestry with EBA Steppe peoples. Please note that I'll be doing another run at the end of next month. It'll be exactly the same as the last one, so no point doing it again for anyone who's already done it. Interestingly, what I found is that this test is very good at picking up not only minor Ashkenazi ancestry, but also minor Sephardic Jewish ancestry, so if anyone is interested in exploring this possibility then taking part in this exercise should be very useful. Possibly of interest (not sure if anyone read the other posts): I was having a look again at the matrix of group averages. Thinking about this, I carried out a square root transformation of the matrix. That would make the covariance between large (e.g. at most extreme Nganasan) and small dimensions (at most extreme, Cypriot) a lot more even. This gives something which is more reflective of deep structure and less dominated by the recent structure. This process, using the square root of the matrix / CM may be useful if you want to look at a slightly different balance of the recent and ancient structure (downside is that this isn't really interpretable in the same straightforward way). (Various graphs using the square root of shared CM: https://imgur.com/a/XhLG3). The final run is underway. Please note that the results should be ready on Sunday or Monday. The output files from the latest run have been sent out to the participants. Please let me know if you didn't get your files yet (though check your junk mail folder first). Also please let me know if there's something wrong with your files, like columns or rows missing or the wrong name in your files. This was the last IBD/haplotype run for a while. I might do more next year, or not. By the way, the full matrix with the reference samples is located here. It shouldn't be much different from the matrix of the same type from the previous run. It is further notable that *none* of the other individuals who are classified as Mongolian in your Full list have any value above 25 for any of the Altaians and Tuvinians, mostly staying below 15 (only with some Buryats they share more than 30). So, anyway, Mongolian_GS000035236 is really more Tuvinian. Might be. I just keep the labels that they come with. Also, I checked out the English_Kent_HG00154 individual who appears curiously similar to my Iranian Azeri father-in-law. Not sure if that's meaningful unless your father-in-law himself shares at least a few cM with this English Kent individual. That's the point -- my father-in-law shares 17.27 cM with that Kent individual (the most he shares with anyone in your list). That's why I checked him out. OK, I see. This individual from Kent might have some minor but recent ancestry from western Asia. Lots of people settled in London an surrounds from a lot of different places during the past 200 years or so. Then again, this might just be the result of an unusual accumulation of ancient segments from the Bronze Age steppe and even Neolithic western Asia. I have to look at the 2 and 3 hop neighborhoods to learn more (if there is more information to be gained). I had a closer look at that shared cM between your father in law and the sample from Kent. It's actually a single hit, so probably a cold spot. But at first glance, your father in law does show a lot of shared segments with Northern Europeans. If you have Jewish ancestry you'll share some cM with all or almost all of the Ashkenazi and Sephardi samples in this analysis. So if you're seeing a few zeros between you and the Ashkenazi and Sephardi samples in the cM column, then chances are you don't have any Jewish ancestry. Interesting, thanks for checking. My husband's family name means "from Karabagh" as they are known to have migrated from Karabagh upon the Russo-Persian war a couple centuries ago, and the name is shared by both Azeris and Armenians of Iran. Certainly, some of his ancestors' relations would have stayed in the Russian empire. By the way, do you have the shared segment information (locations and lengths) stored for that matrix, or did you recalculate it? I have the segment information, but it's too bulky to edit and send over to each participant. I'd need some sort of script to extract the info for each individual. Don't have anything like that yet. Ok, I appreciate if you do not delete it (I'm guessing time is more valuable to you than space). I don't plan on deleting the raw output for a while, in case someone wants to check something.